It has become family legend that, back in 1997 when I first encountered Tim Rice and Andrew Lloyd Webber's Jesus Christ Superstar, I left the Lyceum theatre sobbing. My dad and brother managed to decipher the words "you didn't tell me that there wasn't a resurrection" from my distress-wracked attempt to speak. In other words, Jesus Christ Superstar moved me. It showed me, in a way that had been absent from my knowledge of the New Testament and experience of church services every Easter, that the central story of Christianity involves a sacrifice that is profoundly and paradoxically human: a man, frail and human, yet convinced of - if not confident in - his own divinity, chooses painful and lonely death for reasons that are beyond the understanding of his friends. I have discussed that production and Steve Balsamo's peerless personification of Jesus many times in the intervening 15 years. It was a key reason in my decision to study the medieval mystery plays and their own version of this affective piety - bringing each audience member to an emotional understanding and belief of something that they have previously known only intellectually. Last weekend, when performing in an amateur production of JCS, I could hear and see audience members' distress at the Crucifixion. Jesus Christ Superstar works as theatre because we care, whether we believe he is the Christ or whether we simply relate to him as an exceptional human being, when he dies. This long introduction is necessary to explain my reaction to ALW's new arena production of JCS. At the NIA last night (4th September 2012), I did not see a single person cry. I would be surprised if any of the several thousand people in the audience gained a new understanding of the sacrifice at the heart of the Christian story. The main failing here is in the portrayal of Jesus. I didn't watch the TV show Superstar but photos in the production brochure show Ben Forster looking like a normal grown man. So it is completely baffling to me that a decision has been made to grow his hair (or use a wig) to give him a fringe that makes him looks like Harry Enfield's Kevin. The Kevin and Perry parallel would have amused me momentarily but not caused fatal alienation from the story if Forster had more emotional range in his performance. During the first act, there was no charisma from him that would have explained why he had attracted so many followers. After the interval, he had transitioned from bland to grumpy teenager. He sang Gethsemane as Kevin, with a single emotion: "I'm pissed off with my dad for making me do stuff I don't want to do". Watch a recording on YouTube of Steve Balsamo singing the song: he shows an enormous range of emotions. There are 7 minutes for Jesus to go through his fear, pain, (yes) anger, confusion, determination, resignation. Ian Page (Jesus) on stage in Solihull SMASH's production of JCS, 29th September 2012. 7 minutes of anger may be impressive (and the audience whooped and cheered at the end of the song) but they do not add to a nuanced understanding of Jesus' soteriological sacrifice. Forster's portrayal was hindered further by the odd staging of the Crucifixion. After Judas had descended onto the stage on a lit piece of rigging, Jesus (now in the Guantanamo orange jumpsuit that was a slightly desperate attempt for yet more contemporary resonance) was attached to the bar and lifted. So a half orange figure was hanging off a glitzy bit of rigging. A vertical bar came down, but unless you were sitting directly in front of the stage (and the nature of an arena means that most of the audience were not), the horizontal and vertical did not meet to make a cross. And what does a glitzy lit cross say about painful human death anyway? Added to this oddness was more evidence of Forster's limitations as an actor. All of his lines on the cross came out as a tantrum. I just wanted him to shut up. Possibly not the desired reaction when the saviour of mankind is sacrificing himself to grant me eternal life. The major flaws in the production were partly to do with the arena setting. The balance between volume of the band, soloists and chorus was wrong. I had to block one ear with my finger to make the noise bearable for band and soloists but it was very hard to hear anything from the chorus. This significantly lessens the impact of the enthusiasm of the crowd as Jesus enters Jerusalem and then their bloodthirst as enthusiasm turns to desire for his death. Further, the director had a massive space to use. Rather than containing the action on a tiny stage far away from most of the thousands of audience members, why not use a thrust stage? My own preference would have been for a production in the round. Clearly it would have been a challenge for the director. But if you are charging £70 per ticket, I feel that you should work hard for it. The lighting was mostly unremarkable, except when it went wrong, as in Could We Start Again Please? Mel C., as Mary Magdalene, was spotlit but when Peter came in, I had no idea whereabouts on the stage he was (the director had set Mary and Peter sitting among other disillusioned followers). The whole song felt flat and unmoving, probably because so much mental energy was taken up with trying to spot Peter on the stage. I had imagined that Mel C. would have been well able to cope with the demands of singing in an arena. But, as some friends suggested at the interval, she could have done with several extra bars of instrumental before each of her songs because, without fail, she came in in the wrong key. Plus even once she had reunited her melody with the band, she was flat at the top of her register. Further confusion ensued during I Don't Know How to Love Him. During the instrumental break, she started to wipe off all her make up. It was unclear whether this was a symbolic rejection of her previous life as a prostitute or, as was indicated a little later when she took her jacket off, she was just getting ready to go to bed. Mel C. was most convincing when she was part of the mob of followers, participating enthusiastically in the choreography. The question of whether to dance is difficult for directors of JCS. Sometimes, the desire for naturalism restricts use of choreography to stylised numbers such as Herod's Song. Here, clever choreography managed to create a visual spectacle during the numbers where Christ's followers surround him, such as Simon Zealotes' call to action. I had mixed reactions to the use of media on screens. I cringed (and wanted to throw things) when made up "txt spk" twitter, FB, etc. messages flashed across the screen during What's the Buzz? The contemporary parallel felt forced and ridiculous. However, when the high priests met to discuss the threat, showing the crowds (who have several lines that punctuate the priests' discussion) on CCTV for the priests to see them contributed to our understanding of why Caiaphas and Annas felt threatened by Jesus' followers. In fact, the priests, along with Pilate, turned out to be the stars of the show. All of these men seem to be seasoned musical theatre performers, able to act and sing simultaneously (which is hardly revolutionary in musical theatre but - believe me - it was last night). Pete Gallagher and Gerard Bentall had the perfect registers to provide the memorable contrast between Caiaphas and Annas. Alex Hanson was an interesting and interested Pilate, from his recounting of his dream to an assistant helping him robe for a day in court with a dismissive laugh at the end through to his final attempts to get something, anything, from Jesus that would allow him to be set free. Cleverly, the first "trial by Pilate" was set with Pilate returning from a session with his personal trainer. More concerned with his workout than with this odd proposition before him, Pilate continued with his push-ups while singing, making sense of the strangely-broken rhythm in the score at this point. My only quibble with Hanson came from the brochure, where his self-penned biography contained two unnecessary apostrophes. Luckily I had a pencil in my bad for emergency apostrophe triage. Much has been made of the casting of Tim Minchin as Judas. Personally, I'd have found it more interesting to see him (as an avowed atheist) play Jesus. His stage presence was diminished by the scarf and coat he wore during Heaven on his Mind, which made him hunched and small. Frequently, in his dialogue with Jesus, he struggled to act when not singing. This would have been less noticeable if the screens hadn't projected images of him standing awkwardly waiting for his next line. The confidence to make each song his own, complete with melodic alterations from his own composer's brain, was refreshing but his diction is weird (and no, this isn't to do with him being Australian. I can understand every word that, for example, Philip Quast sings). If I didn't know every word of JCS off by heart, I don't think I'd have had a clue what he was singing. While JCS is a "wordy" piece of theatre and Judas has a lot to tell the audience, last weekend, in Solihull, Thom Stafford simultaneously conveyed Judas' intense emotional disarray with pitch perfect singing and clear articulation of Tim Rice's lyrics. However, my reservations about his portrayal of Judas dissipated in Act 2. The moment of betrayal was directed beautifully. As Judas approached Jesus, we could see his conflicted sadness that none of the other apostles were awake to save Jesus from the soldiers. The kiss was like a reflex - a goodbye to a friend, truly loved. This physical connection allowed Jesus to grab his arm: "Judas, must you betray me with a kiss?" And then the two men hugged. A warm, desperate hug of friends who have each involved the other in his own downfall. They are the only two who understand each other at this point and they do not want to let go. This moment of painful friendship had to be split up by the soldiers, with Judas having to be restrained from helping his friend, even while in the action of betraying him. This was the first moment that demanded an emotional response from me. The second was almost unbearable. I have lost a friend to suicide recently, so Judas' suicide is obviously difficult to watch for me. In fact, I think I'd have preferred if the production had been as weirdly disconnected here as elsewhere but, instead, Tim Minchin physically and vocally articulated the intense distress of desolation: that moment, known to those of us who have experienced our minds being overtaken with thoughts we don't want and can't bear, when you can't speak, can't move, can't be... He fell forward with an elemental, untranscribable, vocalisation of despair that somehow marked the moment at which he, and we, knew the only way out for him. The tree, the muttered, half-swallowed "you have murdered me". Death. That scene showed me that the talent in this production could have given us something amazing. Instead, the biggest audiences ever to see the show are being palmed off with a Jesus Christ Superstar that manages to provide spectacle but no way to relate to the incomprehensible human sacrifice of Jesus. [Apologies for using photos of our production to illustrate a review of this production; I wanted to put some images in but only "own" the photos I took last weekend and don't want to risk the wrath of the Really Useful Group over their production photos]. I've not been on here yet in July. A lot has been happening in Real Life and I haven't been in a blogging frame of mind. However, I have been in a darning frame of mind after getting some new pointe shoes at a bargain price on eBay. 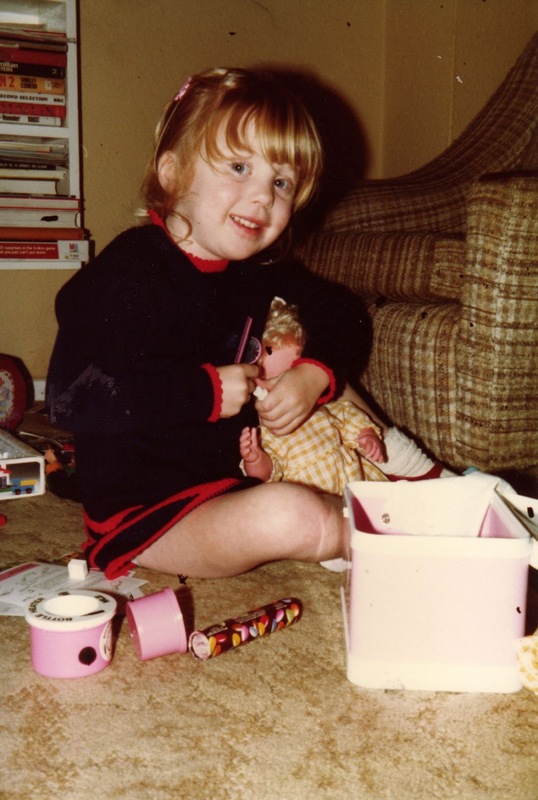 As a teenager, I was a Gamba, then a Freed girl for pointe shoes. 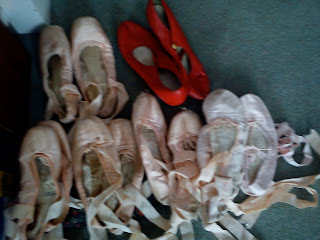 Returning to pointe this year, I considered using my most recent, albeit a bit old, pair of Freeds. They are darned to within an inch of their life and "pancaked" with calamine lotion! Despite the fact that they are still "blocked" enough, rediscovering my love of ballet meant that I also rediscovered my love of ballet shopping! And unlike when I was a teenager, I can now spend hours looking at Ballet Stuff online. I found some brand new Capezio Glisses on eBay at a lower price than I used to pay for Freed 15 years ago. They were very bright and shiny when they arrived. Another innovation is the change in ribbons: it's now standard to use elastic on pointe shoes and even to have special elasto-rib ribbons to protect the Achilles tendon. The elastic is brilliant for me because I have a high arch so my foot contracts when pointed and I used to frequently have the back of my shoe slip off in class. This is what they look like post-darning and having been worn for weekly pointe class since the end of April. As you can see, the Capezio has a very square toe, similar to the style of my old Freed shoes. These really suit my feet but... having read a lot online about Grishkos, I was curious about them, so when I saw a pair on eBay for just £9.99 I couldn't resist. I also tried something new with the darning. I usually just use chain stitch all over the toe and down towards the sole. Here, I used blanket stitch around the toe and then filled it with chain stitch. The soft blocks bizarrely cost a lot more than either pair of new pointe shoes, possibly because exam boards like RAD no longer insist on students wearing them for higher grade exams. To compensate, I frugally harvested some ribbons off an old and battered pair! and the pile of old ballet shoes (and one pair of character shoes) that I found when I went looking through my stuff earlier this year. Purpose (or lack of it) is crucial for the function of the ED. After I handed in my PhD thesis (exactly 2 years ago, give or take 4 days - 30th June 2010), instead of the joy and celebration that I'd been expecting, I was hit by a strong feeling of pointlessness and worthlessness. The thing for which I'd been working over the past 3 and a half year was over; I'd not been successful in any job applications so I had nothing pencilled in for the future. My life seemed totally empty and had no purpose. The corollary to this was believing that I had no purpose. There was no point in being me, no reason for me to live. It's easy to see how this absence of purpose allows anorexia to strengthen. If you wake up in the morning unable to face all of the hours in the day, subconsciously, ED thinking enables you to get through those hours. It sets its own challenges and its own rules. Living up to those lessens the feelings of desolation. In 2010, I wasn't well enough to sustain myself through the desolation. Six months after handing in my PhD, I was in hospital again. Funnily enough, my discharge date was 29th June 2011 almost exactly a year after handing in my PhD. Since then, I've been having to work on believing that there is a reason for me, that I'm not pointless, even without those external things by which other people measure success or value. It's incredibly hard. Especially because the current government's desire to carry out welfare reforms involves a lot of spin about how people on disability benefits are often scroungers. The more you hear it in the media, the more you believe it about yourself. I've set myself up as a freelance proofreader for my "permitted work" that is part of ESA (up to 16 hours per week or up to £97). My aim is to make the transition to supporting myself without ESA. However, I'm following the medics' advice and taking things one step at a time. Of course, the most important thing is to believe that there is value just in being me. I would tell a friend that they have a purpose simply in being alive, whether they are currently unable to work, or a stay-at-home mum, or a top academic, or a teacher, or a dinner lady: whatever. We all need to believe that about ourselves: because that belief would make it much harder for the anorexia or ED to set itself up as our purpose. The word 'soul' makes me think of spirituality. In hospital last year, some of us asked whether it would be possible for the hospital chaplain to run a group on EDs, recovery and our spiritual life. In the UK, it's not possible for nurses and doctors to discuss matters of faith; there are examples of people being struck off or reprimanded for offering to pray with a patient, for example. However, if religion has been an important part of someone's life with their ED, it's vital that issues of spirituality are addressed on the road to recovery. I have made friends of various religious backgrounds through ED treatment: Judaism; Islam; Hinduism; Christianity; atheism; agnosticism. My own experience is Christian so my writing today will focus on that. For me, there are aspects of Christianity that underline ED thinking, from lines in the Communion service ("We are not worthy to gather up the crumbs from under the table"), the notion of social justice (it's not right for me to participate in a society of vile consumerism while there are people in the world who are suffering), guilt (when we confess to God "the sins we have done and the good we have not done"), etc. Most interestingly for me, as a medievalist, is the history of Christian ascetics, especially women, whose spiritual "excellence" is predicated on their ability to fast. I remember reading the Life of Christina of Markyate for my MPhil. Even though she lived in the first part of the 12th century, I found the account of her life to be triggering: it described in great detail the extent of her restriction and the physical effects on her body. Indeed, there has been research over the past few decades on the notion of "holy anorexia". For me, my background means that I feel more kinship with the 12th century 'holy anorexics' than with the notion that the fashion industry may be a contributing factor in EDs. I've always had a shaky sense of self worth and I have realised that I internalised a lot of the self-denial and guilt aspects of Christianity as a child. We even sang a song in our children's choir whose chorus went 'Deny yourself, pick up your cross and follow Jesus' (a quotation from Matthew's gospel). Therefore, self denial in all its forms (restriction of food intake, not allowing myself to sit on comfy seats or watch tv, etc) became a way to replace my absent self esteem. I think that those involved with treatment and recovery, even if they themselves have no experience of religion, need to be conscious that various religious traditions can impact on the way that someone experiences their ED. Without addressing those internalised beliefs, it is hard to make recovery lasting and meaningful. Today I've been part of a fight. It has nothing to do with EDs but is connected with one of my most important hobbies: knitting (and most of the earlier entries on the blog are knitting related). Last night, it emerged that the US Olympic Committee wrote a 'cease and desist' letter to Casey, the founder of Ravelry, about our wonderful event 'The Ravelympics'. Gawker picked up the story and so did Hot Air (and their coverage of the story enables us to forgive them for characterising all knitters as 'old ladies'). #ravelympics was trending on Twitter. The USOC Facebook page was inundated with comments; their email address was removed from their website after the volume of messages caused their system to crash. Earlier on, an apology was issued. It was then updated to reflect further outrage that the USOC seemed to think that their 'show of support' for Ravelry would be to ask us to send them knitted items. Raveler "Jinniver" wrote a great post about it on her blog. The latest apology is more acceptable. But no one knows whether Casey and the Ravelry team are going to continue to face further action over the Ravelympics name. None of this is ED-related. BUT it does show that fighting brings progress - whether we are fighting against the petty brand enforcement of an organisation that's terrified of losing support of its corporate sponsors, or whether our fight is the day-to-day internal struggle to allow ourselves to eat, to rest, to be well. Penny: Your hair looks very nice. Amy: Are you a homosexual? Penny: No. No. I was just giving you a compliment. Amy: Oh. I would have been more flattered if you were a homosexual. Compliments are tricky because the sentiment of giving one does not guarantee the sentiment in which it will be received. The most frequent misinterpreted compliment in EDs - and most particularly in recovery - is when someone says 'You look well.' This seems to translate directly into 'You look fat' in the head of someone with an ED, especially if we know that we've been working hard on recovery and have put on weight. It was something discussed often in my ED unit, especially in Monday morning support group when everyone was talking through their weekend leave. Nurses would point out that, to friends and family, looking 'well' could mean anything: being less pale, having better hair condition and brighter skin, not about to die, etc., etc. .... and, yes, looking as though one has put on weight. But, if you've become ill enough with anorexia to be hospitalised, you probably need to put on weight and even though it feels impossibly difficult, as recovery happens, this is something that people will say. Even if every single time it happens we have to go through all the reasons why it's ok to hear this, we must do it. Otherwise 'you're looking well' can be fuel to the fire of the illness. I'd like Sheldon to speak for himself. Those things were horrible to live through. I suppose I can laugh now because recovery *does* help us get our humour back. It's something that professionals at hospital have said to me: when I am first admitted, I am a shell of a person, frightened to be, scared to take up space. In a few months, more *me* appears... I can allow myself to share my humour with other people. I want to hold onto *me* and not to return to that shell. Endings are hard. I associate the word with pain. We moved house first when i was two and I could only cope by sitting on the floor with photo albums as the removal men packed up the house around us. Since then, there have been many more endings: leaving Harpenden when I was 9 and the anguish at being separated from my friends; leaving Solihull at 16 then a month later leaving home to go to boarding school... two years after that, the pain at leaving that school and my very close friends was just as bad. I could go on. However, in typing this, it is clear that each painful ending has been followed by another one precisely because that ending has been a new beginning. 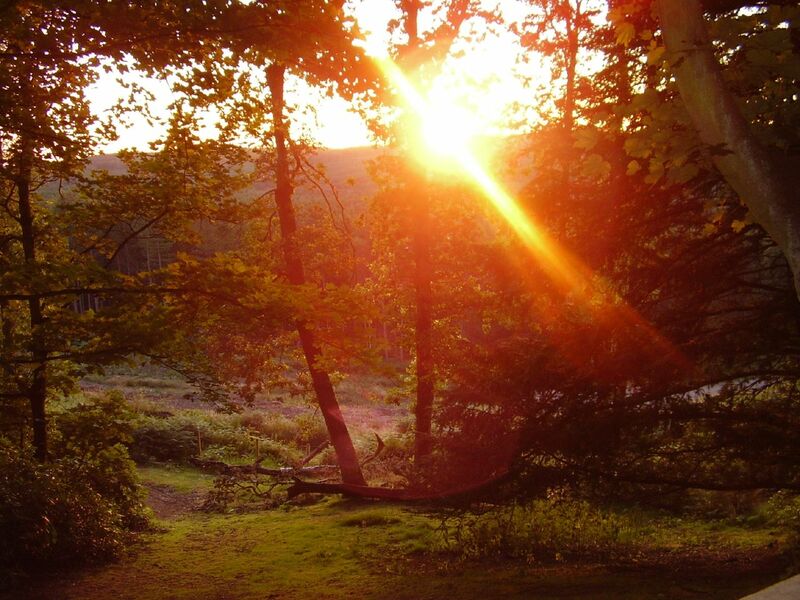 If I'd remained deeply unhappy at leaving Harpenden and had not been able to move on and make new friends and find a new life in Solihull, my pain when leaving there at 16 would not have existed. This kind of reminds me of the metaphor of anorexia as a life raft in a shipwreck. It manages to keep you afloat in a time of deep turmoil but you have to let go of it in order to swim to the ship that has come to rescue you. But letting go is terrifying: how do you know that you will reach the ship? isn't it more likely that you'll drown in the space between the two. Yet the ship represents safety: a new beginning. The ending point of an ED, the start of the recovery process... these things are terrifying. They will cause all sorts of pain and anguish. But we have to trust that time will allow us to find safety in something better: in life; in living; in finding and being ourselves. I wanted to get back on track with the June challenge but I've been very affected by a story in the news today. The BBC has summarised it thus: "A woman with "severe" anorexia who wanted to be allowed to die is to be force fed in her "best interests" by order of a High Court judge. Mr Justice Peter Jackson declared that the 32-year-old from Wales, who cannot be identified, did not have the capacity to make decisions for herself." This has raised all sorts of questions in my head. Clearly, the resonances with my own life are huge. I was 32 when I was sectioned under the Mental Health Act so that the hospital had the power to make me stay and to give me nutrition via an NG tube. It was not my first hospital admission; however, even though assessment under the Mental Health Act had been mentioned in previous admissions, on those times, I'd somehow been able to make the decision to stay and to assent to NG feeding if I was not able to feed myself. I'm not certain why this particular case has reached the High Court. The Mental Health Act is usually enough to resolve things. One psychiatrist interviewed on Radio 4 news earlier said that the Mental Capacity Act is also available in such situations. The article suggests that the lady (known as E to protect her identity) and her treatment team had been following a palliative care plan. I think it implies that her family had reservations and this is why the case has reached the court system. I'm incredibly torn about this. I've heard friends screaming as they are force-fed with an NG tube. It's distressing even if you aren't physically fighting against it. The judge has said "I have been struck by the fact that the people who know E best do not favour further treatment. They think that she has had enough and believe that her wishes should be respected. "They believe she should be allowed a dignified death." He also points out that forcefeeding "does not merely entail bodily intrusion of the most intimate kind, but the overbearing of E's will in a way that she experiences as abusive". But this judge also notes that while E is gravely ill, he does not believe she is incurable. And this is so, so crucial to this case: while E may not currently have any hope for her life, I know from experience that, after the horror of starting treatment without any sense that one's life has a point or is worth saving, life begins to open up possibilities. I'm still scared of the future; I'm scared that I will never get any better and will never have a family of my own or be well enough to work in a fulfilling career that can sustain my independence. And sometimes my low mood makes it hard to get through all of the hours in the day. However, I can't express how glad I am that the doctors and nurses thought it was worth taking over for me when I was unable to help myself get better. A year on and I have new friends, two dogs snuggled up on my lap as I type and I've met three new babies (belonging to friends) whose lives I would have missed if I'd not made it through the end of 2010. So finally I've realised that this does relate to today's word: beginning. The High Court ruling is a new beginning for E. I don't know E but I hope and pray that this moment marks the start of hope for her. Even though she can't hope for herself right now, Mr Justice Jackson has hope for E. I have hope for E. I hope that the horror of facing the first weeks of refeeding passes without too much pain and trauma. I hope that gradually she begins to have moments of joy, whether it's from the sun shining on a summer flower or a smile from a friend's baby or a shared laugh with a friend in hospital. And I hope that she begins to believe that recovery is possible. I am trying to be organic with this challenge and write about the first thing that pops into my mind when I read the day's word. Today, I saw 'force' and it immediately conjured up memories of time in hospital. The nature of anorexia and the infamous ambivalence towards treatment means that anyone who's been in hospital will have known people who've undergone compulsory treatment, even if they have not, themselves, experienced it. Compulsion can be merely the threat of use of the Mental Health Act to force someone to comply with the ward's routines and regulations. Rarely, force is used physically. If a patient is being held according to a section of the Mental Health Act, nurses are able to restrain them in order to ensure that they comply with treatment. In the sphere of EDs, this is most often manifested as staff holding down a patient in order to site an NG tube and provide nutrition through the tube. (sometimes NG feeding is done on voluntary patients or on involuntary patients without restraint, because as an involuntary patient, you know that if you refuse the NG feed, restraint will be used). I have never had to be restrained myself but know from experience that the atmosphere on the ward becomes very strained when someone is "refusing", and therefore (possibly) being restrained and tube fed after each of the 3 meals and 4 snacks in the day. The alarms will go off at several times through the day and staff from other wards respond to the alarm to assist with the restraint. All the patients feel wretched for their friend/peer who is experiencing such a difficult time and also feel bad for the way that it affects them: feeling guilty for not refusing; feeling abandoned by the staff; just wanting not to be there. In a way, these situations throw the whole experience of treatment into sharp relief and force us to examine our motivations for being there and whether we are complying with the demands of the staff simply because we are people-pleasers or avoiding conflict or to keep our families happy... Treatment is successful at keeping people with anorexia alive but often has little to do with the active process of recovery. Recovery can't be forced on anyone. It's a gradual process that needs to come from within. I find emotions hard to deal with. And therefore the experience of emotions can impact negatively on recovery. The past few months have been particularly tough in terms of life throwing up emotions : I've suffered a bereavement; the birth of a family baby has forced me to confront my own childlessness and its inextricability from my ED. In fact, the main emotion that I find myself experiencing is sadness. But I can recognise happiness too: when I held that baby, even in my sadness, I enjoyed being close to her tiny life and seeing her calm down when I sang to her. And one of the worst feelings is the flatness. Flatness from low mood. Flatness from the medications. Maybe even the difficulty of intense emotions is preferable to not being able to experience any emotion at all. I'm behind schedule with the June challenge. But for good reasons. Yesterday I was down at my brother's celebrating his birthday a day early. We played Top Golf and I baked him a cake. It was decorated like a camp fire (he's a cub scout leader and, if you like shouty silly slightly rude songs, he's quite a legendary campfire leader). Today I have been at Edgbaston watching the test match with my father. Despite the rain washing out Thursday and Friday, we had a full day's play today and it was a nice atmosphere. I will try to write about some of the missed prompts over the next few days. I'm enjoying being part of the June challenge and seeing different viewpoints on recovery from people at different stages of recovery. Is it the best policy? Sometimes. 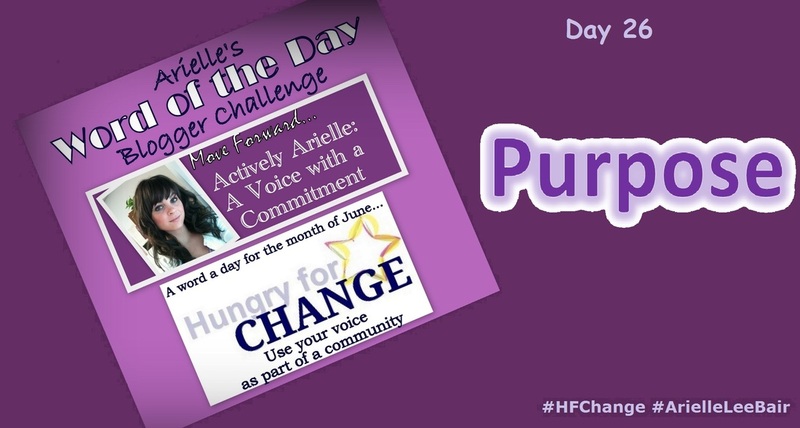 During the May HfC challenge, I challenged myself to share one post with my FB friends. This, to me, was scarier than sharing it within the HfC community. My FB friends know that I have anorexia but I have never before been able to be honest about the reality of my life, my darker thoughts, the way that the illness has impacted my experience of every day over the past few decades. My insides still flip over at the thought that I actually allowed people to read it. On the other hand, the responses I got from people, whether in comments to my post or in private messages, was overwhelming. A few people wrote words of support that brought me to tears. By sharing, by being honest, I seemed to enable friends to be honest with me. Through this, I learned that various people truly value my friendship and even (perhaps) value me ... just for being me. This is something to hold onto: being honest about my darkest times (when I don't like me, and don't want to be me) enabled people to say that they do value me. And that's one step in learning to value myself. I'm in the hate camp with this word. It's problematic in terms of many illnesses (I've read quite a few discussions of the word 'fight' in relation to cancer - and the way that it can unintentionally imply that people who don't survive simply didn't "fight" as hard as other people which is, of course, ridiculous). With EDs, there is definitely an element of fighting. But I never feel like a warrior. To be honest, warrior brings to mind images of Beowulf and dramatic battles... and of victory. Whereas my fight with anorexia is a tedious, on-going, unromantic struggle. There are no dramatic victories. The day-to-day battle with negative thoughts sometimes leads to a step forward. Sometimes it feels like I'm either going backwards or stuck in a painful stasis ... like the feeling of treading water to keep afloat and getting a stitch, being in pain, finding it hard to breathe. You know that you could just let go and let the water absorb you and at least the pain would be over. But the way that I am a warrior is, I suppose, in carrying on. And on. And on. And believing that one day, I'm not going to be treading water but will be moving, dancing and somersaulting, full of energy, reaching towards the shore. When I was a postgrad, some friends and I used to have a conference game: who could find the weirdest new literary theory. Many branches of theory seem to be concerned with taking the voice of a previously marginalised group and tracing it in works of literature. While feminism and post-colonialism have fairly neutral names, other groups have purposely reclaimed previously derogatory terms to identify themselves. So you have 'queer theory' and 'cripple theory'... and, memorably in one session at Leeds, 'queer cripple theory'. Apparently one scholar posed this question: "Are we queering cripple theory or crippling queer theory?" Even as literary students ourselves, we found this level of navel gazing to be rather amusing. I've never been 100% sure about the merits of "reclaiming" pejorative words. I'd be happier if words like 'cripple' were banished from our vocabulary; the negative associations are so great and the danger of childhood (and adult) bullying too real for such words ever to be used neutrally. And there's also a danger of hypocrisy: 'it's ok for me to call myself "crazy" but it's offensive for you to call me that'. I read Arielle's post on this topic today and really like the way that, instead of "reclaiming" the word, she draws our attention to its other, more positive, meanings. Take a look. My dog Benji likes to hide, especially in the mornings when he would rather be asleep than awake. (Just for light relief, here's a video of me trying to get him out from hiding one morning! These photos made me think about the desire not to be seen: to be invisible. In the first picture below, it does take a minute to find him. 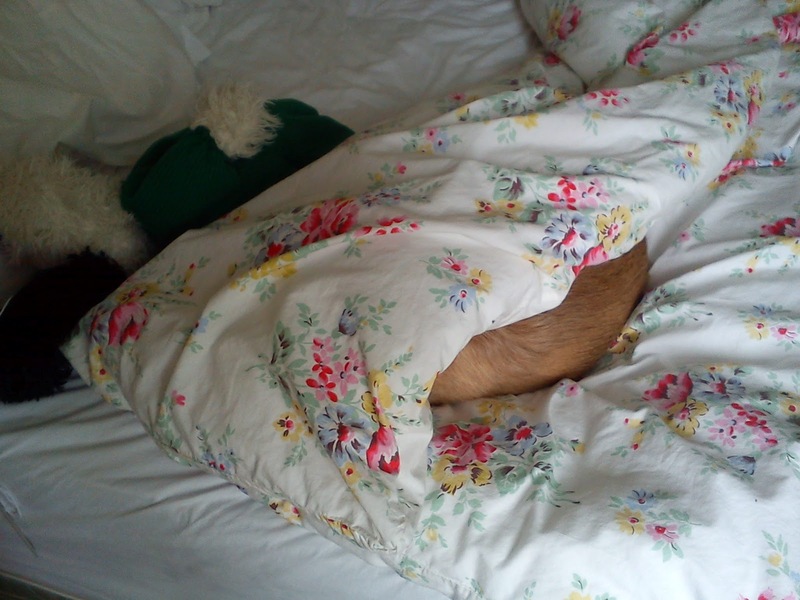 With his bum sticking out, it's clear that Benji isn't nearly as invisible as he hopes. I think that this situation can be a metaphor for invisibility and anorexia. Over a decade ago, I was talking to a dietitian about my clothes. I was wearing 'a size nought' in GAP trousers (this was before the phrase 'size zero' had entered the vernacular). She pointed out that, in wanting to stay as size nought, I was essentially saying that I wanted to be nothing : I wanted not to exist. There's a certain truth to her logic: the act of starving oneself and of trying to decrease one's size is a rejection of corporeal being. However, as life has shown me several times, anorexia fails to make one invisible. You end up as the noticeable figure that people whisper about or even point at; I can remember going to a coffee shop with a friend who was also unwell and when we sat down, the people on the next table looked at us, picked up their things and moved elsewhere. We were the opposite of invisible. Our visibility and strangeness made it impossible for other people to ignore us. And maybe that's the other strand to the dietitian's truth: we are rejecting corporeal being and trying to become nothing. But we are doing so in a way that articulates distress all over our bodies: an invisibility that attracts attention, attracts notice and cries out for the pain to end. 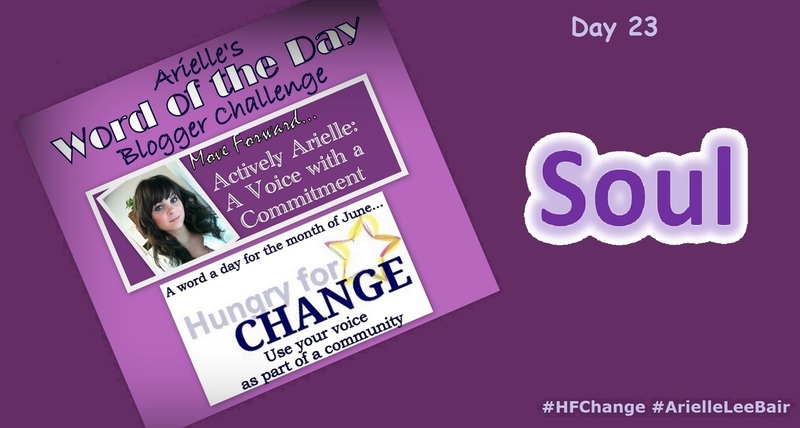 To follow on from May's Hungry for Change challenge, Arielle Blair has started a June challenge in partnership with HfC. Anyone who looks back on my blog archive will realise that I've never been the most regular blogger in the world. So I think participating in these challenges is good for me: it gives a focus for thoughts and helps prompt me to write. We joke in my family that "I don't do change". It's been a scary thing always, from the first time we moved house when I was just 2 years old. I wouldn't let my parents pack the photo albums and sat in one room surrounded by photos while the removal men loaded up our furniture into the van. My family had to move several times during my childhood, as part of my father's job; I've come to realise that moving into new towns and having to start all over again with attempting to make new friends and to establish myself in a new group of people is one of the factors that made it hard for me to have a stable and consistent sense of self. The particular house move that impacted me most happened when I was 9, nearly 10. I don't know now whether it was my reluctance to make the change and leave my friends in the other town that made it so hard to be happy in the new place, whether the children in the new school were simply unwilling to accept a new person in their class, or (most likely) a combination of all the factors. Whatever the reason, just after a year after that house move, I was admitted to hospital with a variety of physical and psychological problems .... including not eating. Lots of changes have happened in the years since that first hospital admission. I've grown older, though not necessarily much wiser; I've gone through school, university and post grad; I've been in hospital more times than I should have done. My parents have moved house many more times and I've had to go into new situations and new places .... I don't think I've got much better at "being myself" with new people. I still retreat and withdraw, ending up in the vicious cycle of becoming more isolated because of being too shy/socially anxious to talk to anyone. The danger is, of course, that this fear of change in my world means that I become more reliant on the one thing that seems to be within my control, the one thing that has been a constant for 20 years: anorexia. What needs to happen is for change to stop being the thing to fear and, instead, for it to become the thing I desire. With change, life will have the potential to stop being limited by illness, fear, anxiety. Getting Midge: I'd known for a while that I would one day get another dog but (as with Benji) the arrival of Midge in my life at the end of July last year was unexpected. A friend sent me a webpage so that I could advise her on a dog she was thinking of adopting. She didn't end up getting that dog. But I did end up looking at all the other adoptable dogs on that webpage, noticed little Midge, applied to adopt her and 10 days later had my little girl. She's a very different dog from Benji and her difficult background has led to many challenges, especially at the beginning. She had to learn to trust humans, as well as learning some basic skills, such as walking on a lead and house training. As I write this, she is curled up snoozing by me on the sofa. She now trusts me completely and trots round with me as I go about my daily routine. She adores Benji and follows his lead. The fact that she needs me so much, as her stable person, her rescuer whom she can trust, has given me extra reason to live and carry on fighting. New friends: I met some wonderful people in hospital last year. We connected and have formed a support network. Some other friends (who I previously didn't know) have also become part of this network and I now have people to see every day, who understand the challenges of living with an ED and of fighting every day to get well and stay well. It's actually quite hard to articulate the extent to which these friends have made it possible for me to see hope, even in some very difficult times. They know who they are and the only way I can repay them is to try to give back the same support to them. Last week, making herself comfortable on my knitting!